She loves the leaves in Luxembourg! I am writing this entry from a desk in our hotel room in Brussels, Belgium. Today I am half a world away from the rest of my life. And I'm ready for the break. Already, the wonders of vacation have begun working their magic on me. Yesterday began with a drive to San Francisco International Airport (thank you, Debbie!). Along the way, we picked up McDonalds. Man, that feels like a long time ago. I was exhausted, having just returned from a three-day business trip to Chevy Chase, Maryland. The prospect of spending 10+ hours on another plane made me want to weep. However, this trip brought a special first for Jon and me. We flew Business Class, thanks to the miles Jon has earned on numerous business trips over the last two years, and on a 747, the Business Class seats are on the upper deck of the plane. This is infinitely cool. Not only is it quieter, more spacious and more private, but we're almost three stories off the ground AND we're up near the entrance to the cockpit. 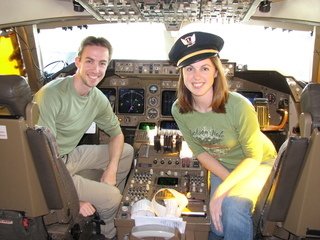 This last perk may not seem like much to most, but our journey got of to a-- er-- flying start when the First Officer just happened to notice us taking giddy, ridiculous pictures of each other while waiting in our seats, and invited us to accompany him into the cockpit to meet the Captain (a chick!) and to take pictures! One of the crew members even tossed me his hat to wear. Jaunty, eh? So, that was unexpected and fantastic. It made the trip worth it for Jonathan immediately. Then, during dinner (pork medallions and potatoes... yum! ), one of the flight attendants got to chatting with us. When she found out that we were on vaction, and apparently determined that we were just way too cute, she offered us a complimentary bottle of champagne to take with us on the remainder of our adventure. Awwwwwwww. Finding our way through the airport at Frankfurt, and hailing our rental car shuttle, proved to be a challenge. Outside it was overcast, frigid and raining, but we'd seen the stunning fall colors from our windows during the descent, and even the weather couldn't veil the spectacular reds, yellows and startling greens which make up the German forests in October. My obsession on this trip will undoubtedly be with the leaves. I played with them in Luxembourg. We stopped to have dinner (pizza at a brasserie) and pick up a trinket or two, and ended up taking a stroll down a thousand cobbled steps into a jungle-like arboretum which snakes below a beautiful clock tower which chimed at each quarter of an hour. It was a fairy land, and we hated to leave. 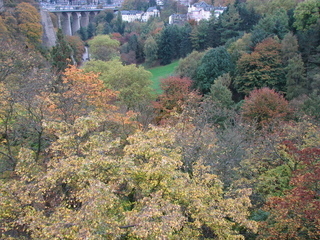 Our time in Luxembourg was regrettably short. Were we to attempt this trip again, we would most certainly spend more time there. Window shopping. Trying out the different trendy cafes. Sigh. Two and a half hours later, we made it into Brussels (and braved the first major navigation miscalculation of the trip- an unintentional jaunt into the heart of the parking structure at Brussels Airport. The mistake cost us two and a half Euro. Ouch!). Here I am, planning to finish off the ten dollar bottle of still water we accidentally purchased at dinner in the restaurant of the hotel (a Marriott... English prevails here... lucky us). We've discovered a couple of channels on the television which we can understand. And the internet works. Tomorrow we'll explore Brussels for the first half of the day, and then it's off to Bremen and Hamburg. I don't know how we'll do it all, but we made it this far already, and we'll sleep VERY well tonight. From the other side of the world, we send our love! She loves the chocolate in Belgium!